I guess you must have wondered if Jagua was spelled wrong. Well, this is quite different from the animal which most people know ― Jaguar. Jagua is a tattoo product that is obtained from the juice that is extracted from the Genipa Americana fruit. The Genipa Americana fruit tree actually grows in South America and has served several South Americans native groups as a natural decorating tool that also helps prevent bites from mosquitos. The Genipa Americana belongs to the Genipa species which can be found in the Caribbean, northern South America, and southern Mexico. It grows in rainforests and is commonly known as Huito. Did you know that the Jagua fruit has a high nutritional value with several essential vitamins such as phosphorus, calcium, and vitamin B? Also, the indigenous people of the rainforest use the Jagua fruit as a medicine because it is believed to contain antibiotic properties. Despite the various uses of the fruit, Jagua is mainly harvested for its dyeing properties. The stains from a Jagua tattoo has a deep blue-black color which is similar to the tattoos done with a needle and ink. During the preparation of Jagua, the fruit is picked when it’s unripe (the color is green), then it’s peeled and the juice is extracted from it. The Juice is turned into a gel that is suitable for body art. Different suppliers of Jagua have their method of PREPARING the gel. Also, other ingredients are added to the Jagua gel to produce the best results. Some of the ingredients added include Xanthan gum, citric acid, Potassium sorbate and lavender essential oil. Most Jagua stains can actually last for a month depending on the skin type. The Jagua temporary tattoo can last for up to 4 weeks on the body depending on the skin type. Also, there are other factors that may affect the duration of the stain.• First, different skin shades, lifestyle, and chemistry affects the duration of the stain.• Several activities such as rubbing of clothes on the stain, bathing, and swimming can shorten the duration of the stain• Finally, stains located in certain regions of the body such as the torso, legs, and arms last longest and the ones on thicker skinned areas of the body such as feet and hands also have darker stains. 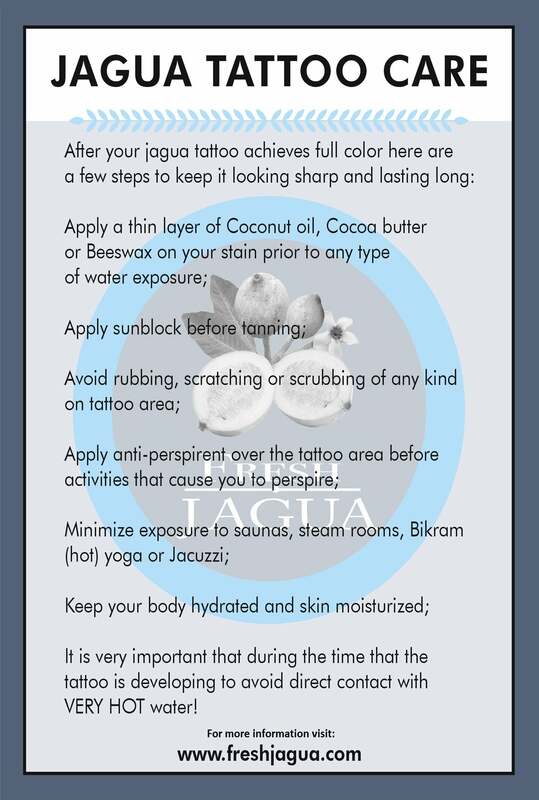 Yes, Jagua is safe and does not contain harmful chemicals. It is similar to henna in several ways, it is made from a plant and has been used safely by several Amazon tribes for ages. However, there might be cases of allergies for people that are allergic to most tropical fruits. If you are sensitive, then you can do a patch test before using Jagua or discuss your concerns with your doctor. Also, in some individuals, when fresh Jagua body art is exposed to heat within the first 48 hours, it can actually lead to a reaction. In the event that you have a bad reaction to Jagua, you can use hydrocortisone or any other natural remedy to relieve the itchiness which is usually not severe. Henna tattoos are more popular at street fairs, beaches, festivals, boardwalks and it is culturally used for wedding ceremonies and religious events. However, Jagua is still much unknown to many people and several professional henna tattoo artists. If you need to create a temporary tattoo that looks just like the real thing, then you need to consider the color of the tattoo product. The color of henna tattoo is brown and despite being nice, they don't really appear as real tattoos. Henna will definitely serve those interested in creating a traditional Mehndi tattoo because of the natural brown color of henna. Natural henna tattoos are mainly brown with a slight hint of red. Another feature of the henna that gives it a different look is the texture and most people don't really consider it. The texture of the tattoo product makes a great difference in the tattoo designs. Henna paste has great similarities with the toothpaste and because of its soft and grainy feel, it's perfect for creating traditional Mehndi designs. Also, the consistency gives the henna patterns the bold and 3D look (while the paste is still on the skin) and it really looks great in pictures. Jagua gel, unlike henna, provides black stains having a hint of blue which looks like the color of permanent tattoos. It is perfect for creating realistic looking tattoos that can even fool the most experienced tattoo enthusiasts. Also, Jagua gel does not create that bold and raised effect like henna, rather, it dries flat.The Jagua gel offers you the consistency of hair gel, although it is thin and smooth, it is not runny. As a result of its smooth consistency, Jagua can be applied with very fine applicator tips and this gives room for the creation of extremely intricate designs with fine detail. Also, the Jagua gel is good for shading which cannot be done with henna paste. Although both Jagua and henna last on the skin for about 1 to 2 weeks depending on the part of the body where they are applied, Jagua designs tend to averagely last about 2-4 days longer than henna designs. So, if you need a tattoo that will stay on your skin for the longest period of time, then consider using Jagua gel. The Jagua gel offers you a blue-black ink which is very similar to permanent tattoos and it is the perfect choice for anyone who wants the impressive ink and also the admiration that comes with it without experiencing the cost, pain, and commitment of a permanent tattoo. If you are considering a permanent tattoo, then Jagua tattoos will serve as a great trial before having a permanent one. It will enable you to have a good idea of how the permanent tattoo will look like in reality so you can make your decision.